Badminton on Friday, where a long rally often ended up with me smashing the shuttlecock past the line. But I’ve stopped playing for points against J a long time ago. I just enjoy the game now. :) Went to Chocolate Kiss later and tried their elusive chicken kebabs with yogurt sauce. 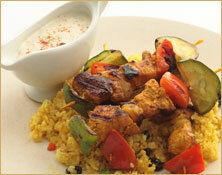 Skewers of chicken fillet marinated in Mediterranean spices. Served with yogurt sauce, and turmeric rice or warm pita bread. Highly recommended! For dinner we had seared chicken breasts and homemade slaw and the cake slices we weren’t able to finish at Cho Kiss. I should have taken pictures, J sears chicken perfectly. 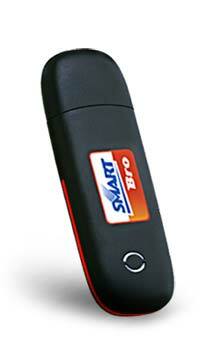 I asked people online and most of my friends said Smart Bro is more reliable than Globe. What I didn’t like is that the free 125 hours of surfing the prepaid Power Plug-it offers can only be used for 5 days. Five days, are you kidding me? At least Globe makes its free hours available for 30 days. But then only Smart offers a one-year warranty for the dongle (heh dongle heh) and its interface shows your load balance. I haven’t tried it myself. I should be able to check it out when I go home for my father’s birthday next week. Oh my God, I hope it works well in Bulacan. You know how it goes. Lunch was pasta with a shot of espresso from Seattle’s Best which, for some reason, did not help me stay awake at all. Later that night, Kanin Club at Ayala Technohub for HGC’s sixth anniversary dinner. :) I’m not a member, but I’m all for geeks and food! Deadly food, it appeared. The group ordered crispy pata and aligue rice. Jaykie and I added pritong manok (fried chicken) and pad thai. I loved everything, but I liked Mango Tree Bistro’s pad thai better. We went back to Jaykie’s place and into that black hole of a drinking game called “I have never”. I have never played “I have never” (shot). We were at Podium earlier today and only then realized that Delifrance is now Cafe France. Oh-kay. I had their dish for Sunday: one-half serving of spaghetti pomodoro and an egg sandwich. I’m craving for that spaghetti pomodoro now. I should have followed my heart (chos!) and bought take-out pasta for my dinner later. In other news, I: am currently a walking vat of cholesterol. This entry was posted in broadband, food, friends, personal. Bookmark the permalink.